William Safire was an alumnus of Syracuse University and also a military veteran. You should know his story because it’s a Syracuse University story—one that speaks to our past, our present, and our future. Born in New York City, William (Bill) Safir’s father passed away when Bill was five years old. His mother raised him and he graduated from the Bronx High School of Science in 1947. He attended Syracuse University, but left after two years to work for The New York Herald Tribune columnist Tex McCrary. He enlisted in the US Army in 1952 to serve as a reporter for the Armed Forces Network in Europe. While in the Army, Safir added an “e” to the end of his surname to ensure correct pronunciation. A few years later in 1959, while working as a public relations executive in Moscow, Safire deftly persuaded Vice President Richard Nixon and Soviet Premier Nikita Khrushchev to participate in the famous “kitchen debate” pitting capitalism versus communism. Nixon quickly hired Safire for his 1960 presidential campaign against John F. Kennedy. Nearly a decade later, he joined the Nixon administration as a speechwriter and special assistant. A distinguished author and columnist for The New York Times, Safire won the 1978 Pulitzer Prize for distinguished commentary for his political column. In addition to his political analysis, he wrote a weekly column called “On Language” and published several fiction novels including Freedom (1987), Full Disclosure (1977), Sleeper Spy (1995), and Scandalmonger (2000). Though he may not have graduated from Syracuse University, Safire delivered commencement addresses in 1978 and 1990 before becoming a university trustee. Bill also donated numerous books from his private collection to E.S. Bird Library in 1996 as a token of gratitude for a scholarship that he had received while attending. Sadly, after a long battle with pancreatic cancer, Bill Safire passed away in 2009 at the age of 79 in Rockville, Maryland. He was survived by his loving wife, Helene; children Mark and Annabel; and his granddaughter, Annabel. 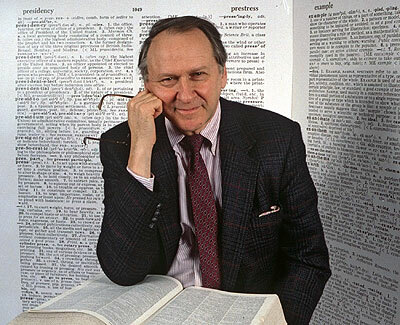 William Safire was an alumnus of Syracuse University and a veteran of the U.S. military. You should know his story.